Governor Adams Oshiomhole has congratulated the Sultan of Sokoto, His Eminence Muhammad Sa’ad Abubakar, on his 10th coronation anniversary, saying the Sultanate has witnessed a remarkable transformation in the past ten years. 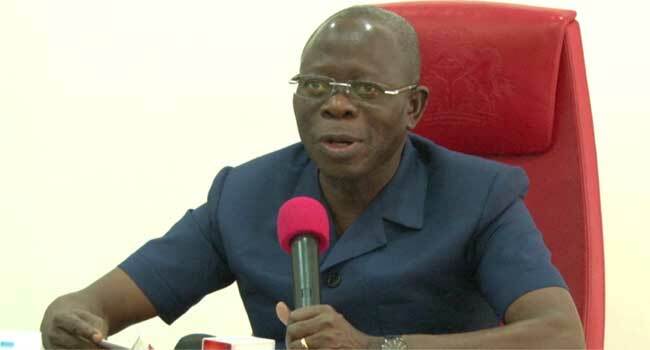 In his congratulatory message, Oshiomhole said “in the last ten years since your Eminence ascended the throne of your revered forebears, you have remained a most worthy friend of the people, irrespective of regional, ethnic, religious or social background. In the same vein, you have continued to be a pillar of unity and peaceful co-existence of the Ummah both in Nigeria and beyond. A real bridge-builder and a man of peace that you are, your leadership has witnessed harmonious co-existence amongst the citizens not only in the Sokoto Caliphate but across Nigeria. “Under Your Eminence’s reign, the Sokoto Caliphate witnessed remarkable socio-cultural, educational, economic, political transformation and, more than at any time in its history, affirmed its pre-eminent status as a world-renowned Sultanate and a Centre of scholarship, nobility and leadership. Despite the fast-changing global and national landscape, Your Eminence has remained a model of how a community can embrace change without sacrificing its cultural and spiritual values. For us in Edo State, we owe it a duty to seize this golden opportunity to appreciate Your Eminence’s courage and invaluable support for our administration, in furtherance of our collective resolve to build a just, equitable and prosperous social order in our dear state.